ActionAid has been working in Ethiopia since 1989, helping rural communities cope with drought, and supporting women and girls to have equal rights and opportunities. Throughout 2017 we are worked with communities in Ethiopia to respond to the East Africa crisis - providing thousands of families who were desperately hungry with urgently needed food, water and shelter. The number of people affected by the 2017 East Africa crisis in Ethiopia. A series of failed rainy seasons caused by El Niño resulted in the worst drought in Ethiopia in 30 years in 2017. Over 10 million people were in need of emergency assistance. Ethiopia’s economy is one of the fastest growing in the world but the long-term effects of civil war, drought and famine in the 1970s and 1980s mean that almost two thirds of Ethiopians are illiterate and 2.8 million children are not in school. Most of these children are girls living in rural areas and children with disabilities. 74% of women have undergone FGM. 41% of girls are married by their 18th birthday. 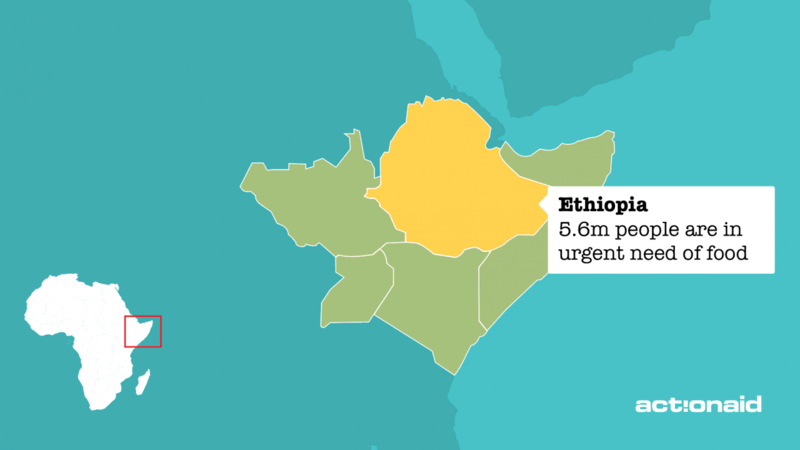 One third of Ethiopians live below the poverty line of less than US $1.25 per day. In Ethiopia three out of four people make a living through farming.1 Nearly half of these farmers are women, who are often denied the right to own or inherit land because of their gender. Female genital mutilation, a brutal practice which can cause death and countless health complications, is common. Girls are taken out of school, and once they are cut, they are often then forced into early marriage. In Ethiopia, ActionAid helps women to set up savings and credit cooperatives. We train women to keep bees, rear animals, grow vegetables and start weaving businesses. We also provide women with information on their inheritance and property rights so they can claim what is rightfully theirs. ActionAid trains women to recognise, prevent and report all forms of violence against women and girls. Members of our Women’s Watch Groups learn about their rights, and feel more confident about reporting cases of child marriage and female genital mutilation (FGM) as a result. We also support girls’ access to education. We work with parent-and-teacher associations and local governments to renovate schools destroyed in recent wars. We have installed clean water facilities, separate toilets for girls and boys and supplied schools with library books and teaching resources. Our work with pre-school children has also helped to change attitudes towards girls’ education. In Amhara Region in northern Ethiopia, we built several pre-schools and trained teachers in early childhood development. This work has been endorsed by the Ethiopian government, who have opened a further 40 pre-schools across the state in the last two years. Gete Haile chairs a savings and credit group in Girar Jarso, in the Shewa region, central Ethiopia. After receiving training and a small loan from ActionAid, she bought two cows. Today her business has grown to include six cows that produce 35 litres of milk a day. Not only is Gete’s business self-sustaining, it has inspired other women to become independent too. As leader of the credit group, Gete is responsible for looking after 300,000 birr (£9,000) in savings to be used by women for local projects. When 12-year-old Chuchu fell ill last year she had to drop out of school. “Now, I spend my days helping my mother with work, feeding the cows, selling the milk at the market, and cleaning around the house," she said. ActionAid is supporting a new school in her community, which will enable her to continue her eduaction and improve her opportunities for the future. Birhane Kenenies, a teacher in the community said, “It is especially important for girls to go to school because when they drop out they often get married. When they attend school they gain confidence and we can educate them about their rights and equality”. When she was 13, Asegedech stood up to her father when he tried to arrange her marriage to a man she didn’t know. With the help of a Child Protection Club and the Women’s Watch Group she helped her father to understand that early marriage is against the law. Asegedech also plucked up the courage to talk to him about how important staying in school was to her. She hopes to become a lawyer when she's older. When emergencies strike ActionAid provides immediate relief as well as rebuilding for the long term. Read more about how we work with women and girls around the world. Learn more about FGM and what we're doing to help communities end it.